Bill Moyers sits down with Mark Johnson, the producer of a remarkable documentary about the simple but transformative power of music: PLAYING FOR CHANGE: PEACE THROUGH MUSIC. The film brings together musicians from around the world  blues singers in a waterlogged New Orleans, chamber groups in Moscow, a South African choir  to collaborate on songs familiar and new, in the effort to foster a new, greater understanding of our commonality. Johnson traveled around the globe and recorded tracks for such classics as "Stand By Me" and Bob Marley's "One World"  creating a new mix in which essentially the performers are all performing together  worlds apart. Often recording with just battery-powered equipment, Johnson found musicians on street corners or in small clubs and they would in turn gather their friends and colleagues  in all, they recorded over 100 musicians from Tibet to Zimbabwe. Just thinking in my mind... what would be unique instruments to juxtapose against each other that had never been heard before: a talking drum and a tabla, they're very similar but they never really come together, or a sitar and a dobro, very similar but how often do you hear them play together? The idea was to go to places that would have some sort of instruments that they could add to the spectrum of the global music that we were trying to find. The Playing For Change Foundation provides resources (facilities, supplies, educational programs, etc) to musicians and communities around the world. The foundation is working with South African poet Lesego Rampolokenga to build the Mehlo Arts Center in Johannesburg, South Africa and building and supporting the Ntonga Music School in the South African township of Guguletu. In addition, Playing For Change is working to enhance and rebuild Tibetan refugee centers in Dharamasala, India and Kathmandu, Nepal. 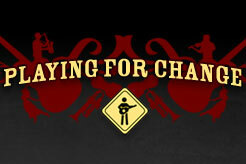 You can find news about their benefit concerts and programs, and listen to additional songs, on their Web site: Playingforchange.com. PLEASE NOTE: PLAYING FOR CHANGE: PEACE THROUGH MUSIC is the second film directed by Mark Johnson and Jonathan Walls. Their previous film, titled PLAYING FOR CHANGE: A CINEMATIC DISCOVERY OF STREET MUSIC was released in 2005, and is currently available through Netflix. Music and video content from PLAYING FOR CHANGE: PEACE THROUGH MUSIC, featured on BILL MOYERS JOURNAL, will be available through Playing For Change's online store in early 2009, and released on CD and DVD in the Spring of 2009 through Hear Music. If you have any questions regarding this project, please email info@playingforchange.com. Performer, activist, songwriter and scholar, Bernice Johnson Reagon has for over 40 years been singing, preaching and teaching traditional African American music and its cultural history. Sarah Chayes, author and former journalist who has been helping rebuild Afghanistan after the fall of the Taliban regime, with a look at the front lines of America's war there. Visit the PLAYING FOR CHANGE site to find out more about the project and hear more of the songs recorded around the world. A note to users, one version, Playingforchange.com. The PBS Teachers Web site has hundreds of lesson plans for all grade levels. Choose from lessons related to KEN BURNS' JAZZ, THE BLUES, AMERICAN MASTERS, and GREAT PERFORMANCES. Bill Moyers sits down to talk about the economic future with with James K. Galbraith, Lloyd Bentsen, Jr. Chair in Government/Business Relations at the LBJ School of Public Affairs at the University of Texas at Austin. Galbraith is the author of six books, the most recent, THE PREDATOR STATE: HOW CONSERVATIVES ABANDONED THE FREE MARKET AND WHY LIBERALS SHOULD TOO.